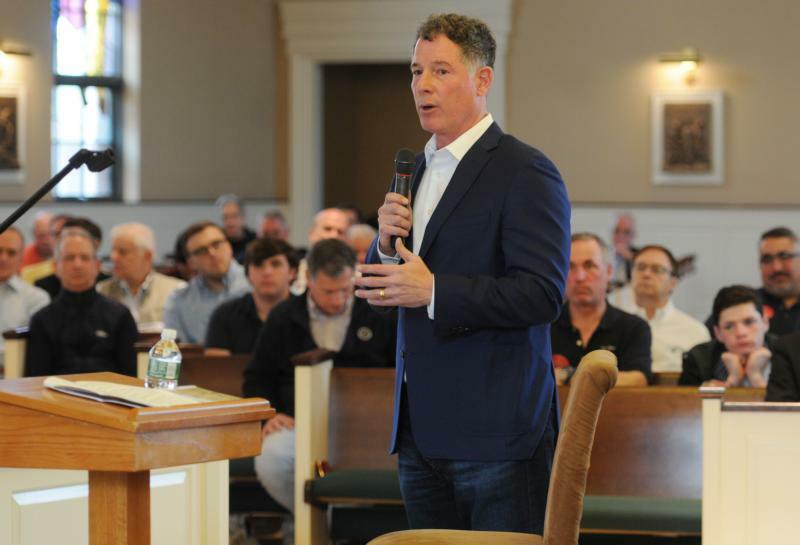 BASKING RIDGE, N.J. (CNS) — Pat Shurmur, the head coach of the New York Giants and a lifelong Catholic, spoke about importance of faith during a Lenten gathering for a group of Catholic men in the Diocese of Metuchen March 30. The coach said he always takes time for quiet reflective thought and prayer during his day. He also stressed the need for active, public and consistent involvement in the sacraments. “You got to live your life and you got to try to make the world a better place and I think that’s what we’re all charged to do,” he said. Shurmur said that even when he’s on the road, he tries to read and pray on a daily basis. “I have a little prayer card that I have laminated,” Shurmur said. “The one thing about coaches, too, because we might get caught in the rain, is if you stand still long enough, they’ll laminate you,” he quipped. While Shurmur leads a busy life, he said he pauses and thanks God, which he invited the men in the audience to do as well. “When your feet hit the floor, just go live a good life, you can make a difference,” he told them. Three other men from the diocese spoke at the gathering at St. James Church in Basking Ridge, which concluded with a Mass celebrated by Metuchen Bishop James F. Checchio. The bishop introduced Shurmur, his longtime friend with whom he became acquainted during his time as the Catholic chaplain for the Philadelphia Eagles in 2002-2003. Shurmur, who is a 20-year veteran of the NFL, talked about visiting Bishop Checchio in Rome when he was vice rector and then rector at the Pontifical North American College. Speaking directly to the several hundred boys and men gathered from around the four-county diocese, many of whom were fathers and sons, Shurmur emphasized the importance of building good and strong relationships. He said his relationship with his father shaped him in ways he can’t even explain. “I really believe we’re a combination of what we deeply believe and what we have experienced,” Shurmur said. “Because of the way he helped me learn how to think and feel, and just the stuff he showed me, he helped shaped me in a way that there’s no way to quantify,” he said of his father. The coach talked about growing up in the Detroit area and going to Mass every Sunday at Divine Child Parish in Dearborn, Michigan. He remembers racing home from Mass to watch Lindsey Nelson and the Notre Dame highlights, since there were no replays at the time. He said his father taught him to live a life of compassion and to help those who can’t help themselves. The coach, a father of four who has been married to his wife, Jennifer, for nearly 29 years, said he prioritizes passing on the faith to his children, too. He said he has spoken to his son Kyle, who played football for Vanderbilt University in Nashville, Tennessee, about the parallels between Catholic faith and coaching, pointing out that they both have to do with following rules, learning to play, correcting the course when needed and encouraging others.